HCM CITY — Traffic police in HCM City have this week launched a crackdown on cyclists who use car lanes. The move was made after the police received complaints from locals about cyclists on Phạm Văn Đồng, Mai Chí Thọ and Võ Văn Kiệt roads. It was reported that a number of cyclists were using lanes designated for cars only and passing through red lights, posing a high risk of traffic accidents. The cyclists were usually travelling in a group for early morning exercise. The fines for anyone caught violating traffic laws are between VNĐ100,000-200,000 ($4.1-8.2) for those who use car lanes and VNĐ60,000-80,000 ($2.5-3.3) for running red lights. There have been a number of accidents caused by cyclists flouting traffic rules. 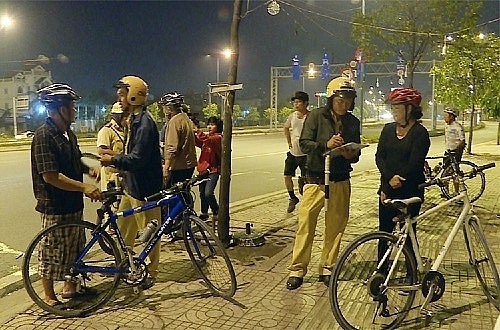 Last October, a cyclist was killed after being hit by a car on Phạm Văn Đồng Road in Thủ Đức District. The cyclist was reportedly in the car lane at the time of the collision.